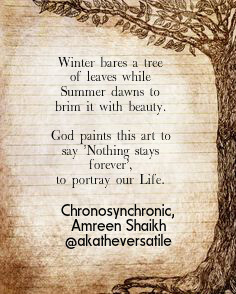 The word ‘Chronosynchronic‘ means ‘Presenting a person’s life in all the stages through a single piece of art‘. This word was given as a prompt to me for a writing challenge. Every member of the poetry club was assigned a different word. The idea was to write a poem on a large word and I somewhat got fascinated towards this word, because though the word takes a while in understanding the pronunciation, its meaning is profound and deep. Hence, this small poem was born, and it depicts the fact that no human’s life stage stays forever and hence, we must learn the message to live in the moment and enjoy it the optimum. Share your thoughts and ideas in the comment section or even a simple appreciation. I’d appreciate. Thank you so much. I would love to see more such posts. 🙂 Sure! Keep reading ! This was great read Amreen. By the way, you have a beautiful blog. Next year I was planning in releasing a poetry book, still have no idea exactly how I´m going to do it, be it through amazon, linkedn, e-book, I really a caveman when it gets to the world of social media-internet. If you have time, since you´re an It professional it would be great if once I figured out how to publish the book, I would like to improve my blog. We can talk about fee´s later on, just letting you know that I would truly appreciate it if next month you could help me on improving my blog. I got the poetry book done and edited, the problema is I have no idea as to what type of outlets there are and how to format the book. Since one of my next year resolution is to improve the bog, I will certainly contact you by mail. And thank you. Previous Previous post: How can YOU help in Supporting Schools for Education! Next Next post: Paint The World With Words is changing to akatheversatile.com!